What are the standard dimensions of dishwasher? Actual size will depend on a type of a dishwasher. All build–in including a drawer and under counter models are made accordingly to the standards of kitchen cabinets. While exact measurements might differ for particular make and model nominal dimensions taken into major consideration. Cut–out width, depth, and height might be the same for a few dishwashers with exact measurements of 23 1/2” W x 24 3/4” D x 33 1/2” H and fully integrated 23 7/8” W 25.1/4” D x 33 7/8”. Standard opening for most of under counter build–in dishwashers will be determined by the stock base kitchen cabinets sizes 34 1/2” high, 24” deep and 24” wide or 2 feet space left in between two cabinets for standard dishwasher. First row is a measurements in imperial system – width, depth and height in inches, second line is a specifications in metric units – dishwasher dimensions in centimeters. Capacity of dishwasher is determined by the amount of place settings. Numbers of cycles for any type of dishwasher vary from 2 to 9, but most quality models will have 4 – 7 wash cycles. 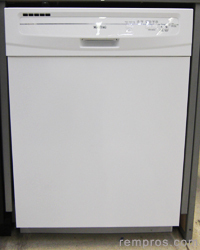 Typically standard 24” W x 25” D x 34” H with 10 places capacity dishwasher will weight 75 – 95 pounds or 34 – 43 kilograms. But some, often higher quality dishwashers might have 120 lb or 54 kg net weight and approximately 125 lb or 57 kg total shipping weight. Smaller 21” W x 19” D x 17” H countertop dishwashers will be lighter because of proportional decrease in size and can weight around 55 – 60 lb. or 25 – 27 kg. What is water consumption for a standard dishwasher? Build–in 24” wide with a 14 – 16 place settings dishwashers will use 5 – 9 gallons or 19 – 34 liters of water per normal cycle. Usage of water will be lower for 6 – 8 place settings countertop dishwashers with a typical range 2 – 4 gallons (7.6 – 15 liters) for normal cycle. A bigger capacity dishwasher is more efficient because less water used per item to wash. Some fully integrated dishwashers typically 24 inches wide, less common 18” are panel ready and will completely match with a kitchen design ones custom made door panel will be installed.